Dining Dish: How many cookbooks do you own? If I were to put a number on the cookbooks I own I would approximate it to be about 200. I am a cookbook addict and need to attend the Betty Ford Clinic. My cookbook compulsion links heavily with my other addiction of purchasing plates, platters and pitchers. (Alliteration intended) Unfortunately there is no support group for cookbook addiction – so I’m reaching out to you to see how many other fellow cookbook junkies are out there. When the Jessica’s BiscuitCookbook Catalog would arrive my body would literally SHAKE with anticipation. 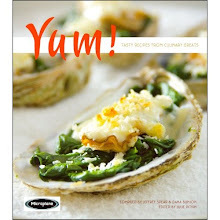 What NEW cookbooks by my fave chefs or cooking instructors were being offered at strong discounts? I would move on from the new cookbooks on to the sale section, cookbooks for $5 or less. I would circle the cookbooks I wanted, narrow my choices and place an order within the hour. And, technology, wonderful technology, giving me Amazon.com – where else can you get a cookbook for a $1 or less. I am grateful that my lust for the printed recipe has not left me washing automobile windshields at traffic lights or down at the ports selling my wares to visiting sailors for cash to support this addiction. Nowadays, I receive many cookbooks for free through my food styling for the authors and through the cookbook publicists who forward advanced copies. I still buy cookbooks. I remember meeting a gal at one of my cooking demonstrations who admitted her addiction had her up to 2,000 cookbooks. In retrospect 200 cookbooks isn’t that bad although I must come clean and admit to my subscriptions to Gourmet, Bon Appetit, Food and Wine, Saveur, Sante, Plate and Intermezzo magazines. My foodie sisters and brothers out there you know the need, the want, the uncontrollable compulsion and lure of the cookbook. To you that new cookbook is like the best novel ever written. Whether you cook from it isn’t relevant, it is subconsciously tasting the ingredients and imagining the aromas as you turn from page-to-page. You can’t pass a book store without lingering 30 minutes in their cushy chairs perusing the latest Lidia Bastianch or Ina Garten tome. My best cookbook find was a GORGEOUS book co-authored by Michael Ruhlman, author of The Making of a Chef and Chef Eric Ripert of Le Bernardin Restaurant called A Return to Cooking at Ollie’s Discounts. The cookbook was not priced and there was no other copy, so the checkout gal charged me $3.95. Even used, today, the book is $17.92 and they are reissuing it in May, 2009 in paperback. Space in my home is at a premium because of this addiction. The breakfast room shelves are filled (see photo), cookbooks are both on top and under my desk and in the office bookshelves. Let me not forget the 10-15 Asian cookbooks I lent the high school ProStart culinary team I’m mentoring that have to come back into the fold. And the cooking magazines fill all the other nooks and crannies. At times I try to be good, I give away cookbooks to deserving foodies only to have the husband return from a flea market or yard sales with double the number of cookbooks given away. My house has become the last frontier looking for space and the cookbooks are like the Tribbles from Star Trek, who like bunnies, keep multiplying. So answer my question, how many cookbooks do you own? Food Trivia: Today, January 3rd is Chocolate Covered Cherry Day - I'm sure I have a recipe somewhere. 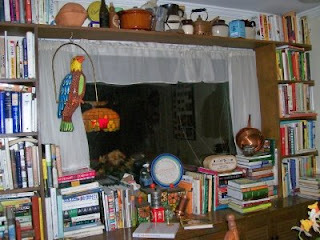 I have at least 200 cookbooks - got two new ones for Christmas this year, both by Mark Bittman. I'd be waaaay too embarrassed to say but it's more than 200. I need a 12-step program for people who buy too many cookbooks.